At 971 m above NN the Wurmberg is the second highest mountain in the Harz and the highest in Lower Saxony (Germany), and for that latter reason, I had to climb it. I was on my way to Braunschweig where I was to participate at a work-related project meeting for a couple of days. Luckily, the meeting would not start until 1pm and after spending the night in Goettingen at Martin Potthoff's house, I was able to get to the top of this mountain in the morning, before continuing the drive to Braunschweig. The nearest town to the Wurmberg is Braunlage. The Wurmberg lies north of the town, in the district of Goslar, and west of Schierke. Its summit is located due south of the Brocken (HP Sachsen-Anhalt) and roughly 400 m (as the crow flies) south of the state border with Sachsen(Saxony)-Anhalt. 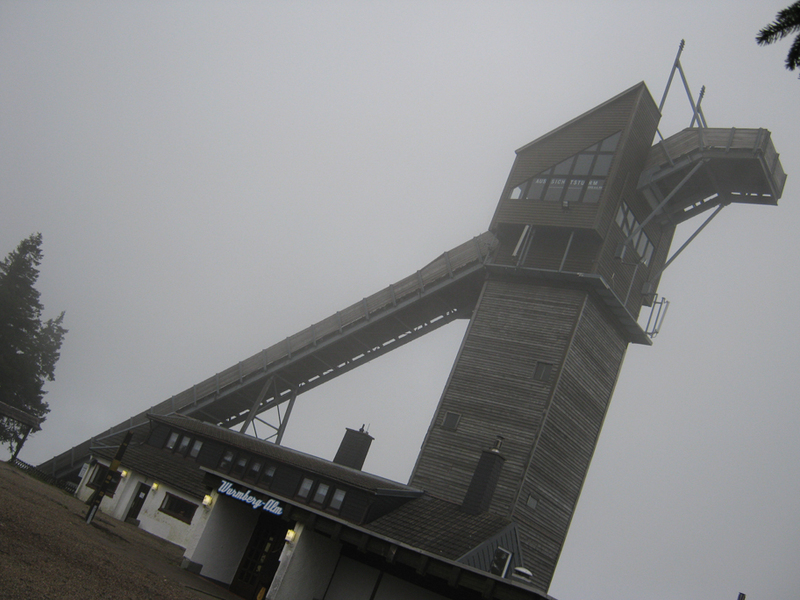 I had been to the summit of the Brocken in the spring of 2008, but due to bad weather had not been able to tag this summit as well. The two mountains are separated by the valley of the Kalte Bode, which in this area is about 660 m above NN. Unfortunately, by the time I drove into the parking lot of the gondola, from where I thought I would begin the hike, dense cloads covered the mountain top and it was raining. I therefore (and because of time constraints) cancelled my hiking trip and took the gondola instead. The 15 minutes gondola ride got me after on stop half way very close to the summit and it was just a 5 minutes stroll to reach the true highpoint. There were lots of buildings at the top, including a little petting zoo, a tv tower (with lots of antenna and parabolic dishes), and the summit tower, which also served as the high point of the ski jump. I took a few pictures, but the weather was really to bad as to take any interesting images. I decided that I have to come back some day on a nicer day. The advantage of the bad weahter was that there were only a few people at the summit. In order to do something climbing-like, I paid one Euro and hiked up the summit tower. Even here views were terrible or better yet non-existent. However after a few minutes of staring into whiteness, I heard a honking sound and recognized it as the train whistle of the historic Brockenbahn train on the nearby mountain. And sure enough after staring intently into the generaly direction of the noise I was able to make out the smoke of the coal-fired engine. It was only for a few seconds, but the train's greying smoke just stood out a little bit from the whitish clouds covering the entire area. Interestingly in this moment I had no idea that less than 36 hours later I would be standing on the top of the Brocken and admiring the train from close. I soon returned to the car via the gondola and drove on to my meeting in Braunschweig.